Published: Dec. 8, 2012 at 04:43 p.m. Updated: Dec. 9, 2012 at 02:17 p.m.
Jerry Brown Jr. found a familiar face when he signed with the Dallas Cowboys' practice squad on Oct. 24. Brown was a college teammate of Cowboys defensive tackle Josh Brent at the University of Illinois, and the two men lived together in Dallas, according to NFL.com's Ian Rapoport. Brown and Brent were together Saturday morning when Brown was killed after a car driven by Brent flipped over. Brent subsequently was arrested Saturday on an intoxication manslaughter charge, which is a second-degree felony. Police said Brent is scheduled to be arraigned Sunday. Brent also was arrested for drunk driving in Champaign County, Ill., in 2009. Before his tragic death at the age of 25, Brown was fighting to keep his NFL dream alive. He previously had played for the Hamilton Tiger-Cats in the CFL and two different franchises in the Arena Football League. 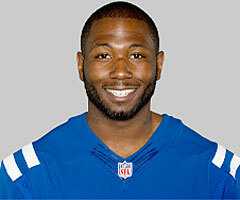 An undrafted player, Brown was signed by the Indianapolis Colts in May 2012. He was active for one game this season in Indianapolis before being released by the team. A recent Facebook post from Brown indicated he was going to be a father soon. Brent's prior arrest and the relationship between him and Brown make this loss of life all the more difficult to stomach. We send our thoughts and condolences to all of Brown's friends and family.